It’s the Sew Mama Sew giveaway day again, these things come round so quickly! And now straight onto the giveaway, because you have loads more to enter, right? I’m giving away these large scraps. All of them to one person. Next time I’ll probably need to give away a whole quilt or something since I’m trying to downsize all my stuff ready for a big move! There’s over 500g here and I’m happy to post out anywhere in the World. Two possible entries! Number 1 – Comment to tell me what you’re currently working on, anything scrappy? Giveaway is open until midday GMT on Sunday 10th May 2015. I’m working on too many projects- a WW1 mini quilt, Oma’s Blues (appliqué), a BOM from Quiltmania, a bear paw quilt for my 2 year old granddaughter and of course the English Country Garden quilt (just needs the sashing now). I follow on Bloglovin and Flickr too. Currently working on Laura Ashley hexagon quilt. Thanks for the giveaway. Follow you via Instagram – fabricstasher24. Oooh I completely forgot about SMS Day! Must find something when get home… as to projects far too many! An applique Sherlock Mini Quilt… hedgehog quilt, sailboat quilt and a slow hexie flower baby quilt. Why is it that other peoples scraps are more fascinating than our own? I like to EPP and applique, so very small scraps are used in all my quilts. I am collecting interesting samples of wool, acrylic fabric for a jacket I am making, a sort of over a blouse type jacket/kimono. Beautiful jacket fabric for the whole thing, with one front panel in a beautiful multi coloured patchwork design. I follow and get new posts by email- thankyou! I love other people’s scraps! Right now I’m working on a large bag that has applique plastered all over. I follow via instagram and feedly. What I should have been doing today were April’s siblingstogether blocks and getting on with my heart cushions. Both scrappy. I’m currently sewing little baby boy things. My daughter should have this baby any day now and I want to stop sewing and get on to some snuggling! Great giveaway! I’m a dedicated blog follower! I’m working on (yet another) Tula Pink quilt – Fade to Pink, though sadly, in colours I would never put together on my own accord. I’m mostly using scraps or fabric from my stash for it. And I follow on Feedly and on Instagram (quiltingrainbows), where you already follow me :). Thanks for a chance to win your scraps – Love scraps! i am in limbo and needing inspiration for a new project… But scrappy, wonky log cabin table runners are a favourite project and I just might start one for fun!!! i follow you via email updates!! Thanks for the chance to win your scraps!!! I’ve just finished a couple of projects that involved some rather frantic stitching to meet the deadline. I’m now feeling “sewn out” and thinking about what to sew next. Follow with Bloglovin and on IG. I’m currently working on what will be either a modern baby quilt, a wall hanging, or a table topper. Not scrappy unfortunately. I am already a follower with Bloglovin. right now I’m working on packing up to move into our new house! Once there I will have a dedicated space for my sewing machine, and I will be unstoppable! I’m always working on something scrappy! A ninepatch at the moment. I’m not working on anything scrappy right now, but these’d be perfect for the small pouches and bags I make! I am working on a batik quilt. So it is sort of scrappy.. I just finished a top recently that Gyleen Fitzgerald designed.. It is VERY Scrappy. I am supposed to be finishing up a sampler quilt that I started a year ago, but needless to say that is not what I am working on right now! I follow your blog and IG (my IG username is hmbredin) – really love reading your posts 🙂 I’m currently working on a cushion using lovely Snowbird batik fabric for my mum’s birthday. Going to do some little sleeping bags from my a friend’s childrens’ bears using scraps! I am making bags and wallets. I’m currently making some zipper wallets from small scraps, I have about 10 of them cut out. Then I have a quilt cut out and ready to start. I’m just learning how to use my brand new Janome 8900QCP Special Edition that I unboxed yesterday! Then I’ll be going to town!! I follow you on Feedly. Thanks for the awesome giveaway, the fabrics look fabulous. I’m currently working on a back for my niece’s fairy quilt (it was far too expensive to buy backing so I’m cobbling something together) and hand quilting my hexy quilt (still!). I can’t wait to see the big Hank face! I follow you through Feedly. Thanks for the giveaway! Yes I am working on scrappy quilts. I have several samplers on the go. One block at a time. 🙂 Are you finally moving here?! If so, hooray! Beautiful fabrics! I’m working on a string quilt for my soon-to-be-born baby girl (and it is definitely scrappy!)! I get notified of your new posts by email,,, and I follow you on Instagram,, under cazsixtythree. What a great giveaway! Right now I have crochet in hand. A nice blanket. I just finished a scrappy NY Beauty and now I’m trying to figure out what to do with the leftovers…maybe a double wedding ring. I am working on a hunting themed graduation quilt. Hi Kerry- i am currently hand appliquing (?) 144 petals onto 6 inch calico squares to make a totally scrappy quilt out of all the odd remnants in my fabric stash..in the orange peel arrangement.. i have cut the petals out of all the green fabrics i had left over from previous projects and some whole fat quarters that had sat there waiting for something to happen to them….. i am really enjoying the hand sewing as i usually do machine piecing….so far the project has cost me £zero, the concept of which i love-a true scrappy money saving project to keep my fidgety fingers working! I am working on scrappy seasonal wall hangings for my kitchen! A dresden plate quilt. I am almost done quilting the top. I also follow your blog by email. Wondering if I’m missing out by not having an Instagram account! I’m making my girls quilts for their beds. I’m almost done! Working on a memory quilt at the moment, but boy is it hard work! I am saving up my scraps for something big!! Thanks for the giveaway!! I am a bloglovin follower! I follow the blog. Thanks for the chance to win. Currently making a BOM quilt along with Quiet Play and then am also using the scraps left over to make some wonky log cabin blocks…for an as yet undecided final product… And so the mountain of Things to do…expands! I love working with scraps. Right now I am seeing blocks of the same color together to make a stack and wack star quilt. Thank you so much for your giveaway. Right now, I am working on a scrappy Snowball and 9 Patch quilt. I love making scrappy I Spy quilts! Scraps are always fun! Great giveaway! Ooo you know I love scraps! I’m working on the hedgehog quilt right now, it’s scrappy in the sense that there are a stack of different fabrics in there! I love scrappy quilts! Right now I’m working on finishing some kits that I had bought years ago. I love scraps and bits to add to my hexagon projects. I also help teach kids quilt. This next year we are planning on a scrappy braid pattern. The fabrics shown would be a lovely addition to the stash. Thanks for the giveaway. I am making a Luke Skywalker costume right now! I am currently working on a few scrappy quilts. I’m currently working on some little girl’s dolls. I always love scraps! Yes, mug rugs! Thanks for sharing. I love the fabric and will put it to good use! I’ve just started a La Passacaglia this evening! Your scraps really are the best! I just remembered that I have to start some quilt blocks for my guild’s charity quilt! I’m working on a scrappy Catvent mini. Scraps are treasure!! I am currently working on a jacket. My most recent projects were toys for my grandkids made from scraps. Those are some pretty scraps. I am working on a wristlet that I designed. Its been fun! I’m crocheting a beach tunic right now, but patchwork project bags are up next! I’m currently working on a cross stitch kit and designing a pattern for a fq bundle I have. I follow you by email. (the one I used to comment). I am working on a quilt runner. I love scrappy quilts. I am planning to start a pillow cover. Making scarves & bags for my bridesmaids! I am working on a doll dress. I’m making some HST’s for a scrappy project. I’m working on a landscape. Thanks for a chance to win. I’m working on a disappearing nine patch quilt. Scrappy is what I love to do most of all….scrappy quilt anything goes….just cut and piece together…. I’m working on a mini quilt for my wall…it’s made from all sorts of fun things…all in shades of yellow/orange and gray/blue. Thanks for the giveaway! I’m still working on a stashbusting scrappy yarn crochet blanket – haven’t had time to work on anything scrappy with fabrics at the moment. I’m working on a square-in-square baby quilt for a friend! I am working on a scrappy pinwheel quilt for my little girl right now! Love getting inspiration from other people’s scarps and cast offs- thanks for the chance to win! I just love that rainbow quilt in your mosaic! And the super sweet dress!!! I was sucked into a (rainbow)scrappy vortex earlier this year…it is resting a bit while I work on a birthday quilt for a sister, and two bed quilts for my two teenage boys 🙂 Your fabrics look wonderful…you had me at Geometric Bliss 🙂 Thank you!!!! I’m kind of stuck right now for my next project….I need something to Jumpstart the creativity. I’ve just finished a pencil case made of various scraps I had lying around. I had to get a bit creative to get pieces big enough for some of the fabric but love how it turned out. I’m working on a lap size apple core quilt for my first ever start-to-finish quilt. I think I bit off a little more than I can chew, but I still love it!! I am finishing hand binding my nephew’s high school graduation gift quilt. Also I am making my kids some summer play clothes and pjs. I’m thinking of doing a farmer’s wife/gypsy wife type thing when all the blocks are pieced. Or maybe a medallion. I’m working on a scrappy floral hand applique wall quilt. I’m almost finished my last block (four in total). I’m following you by email. Funny you should ask. I am working on using up all of my little scraps–you know, those 3″ by 6″ pieces that you just can’t throw avway but have no real use for. I’m procrastinating on baby projects right now! right now I am finishing up a king sized civil war sampler quilt for our sons wedding and making myself a civil war dress for the wedding. One of my current projects is very scrappy. I’m making scrappy string blocks. I am hand-sewing binding to a table runner. Currently working on some Firefly themed outfits for myself, my husband my 2yo daughter for a friend’s birthday party later this month. Scrappy cat block quilt…..need scrappiness! Scrappy cat block pattern on deck. Newish to quilting, so my scrappy stock could totally use this boost! I am working on a large quilt. It was not initially intended to be scrappy, but I used so many prints you could probly consider it scrappy.I used a stained glass print for some of the centers, others are shasta daisies. The sides have owl sashing and the star points are a mix of complementary colors and prints. I am trying to finish 6 scrappy charity quilts. I am working on 6 scrappy charity quilts. I’m working on several scrappy quilts as I make my other quilts–plugging away at them as the right scraps come along from my projects, making quilts for our local Ronald McDonald House in a variety of styles or colors. I follow you via email, Kerry. I am working on finishing table runners for my living room. Thanks! I’m working on a mini quilt. I am working on an easter basket wall hanging. Thanks for hosting the giveaway! I just finished a quilt challenge for a quilt guild I belong to. I haven’t decided on my next project yet. I make so many scrappy things…quilts, rag dolls, skirts, tops, pot holders, etc…nothing in the works right now. Your scraps are wonderful, love your taste in fabric! I just finished piecing a scrappy batik quilt top and now I’m making bright scrappy log cabin blocks for a child’s quilt. Thanks for the chance! Your work is lovely so I have signed up to follow your blog by email so I can see more! I would love to win this! 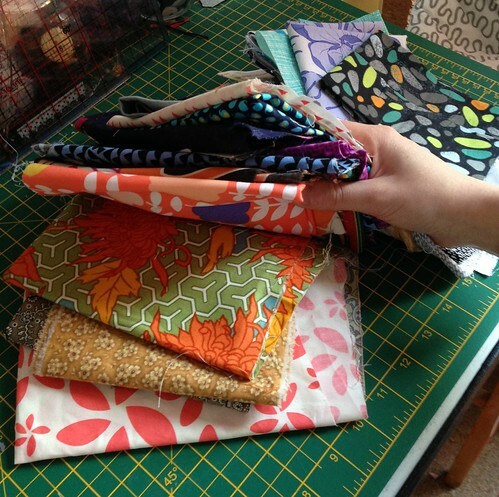 I have zero fabric stash, the purple fabric is gorgeous, and thanks for the chance to win. I am about toquilt an improv scrappy small baby quilt. I used blues, greens and purples out of my scrap baskets! I’m working on a plus quilt at the moment! I’m working on Economy Blocks, and YES, they are SCRAPPY! Right now I am working on dresses for girls in need — I love to make scrappy ones, too. I follow along via Bloglovin’. Working on a scrappy queen size quilt. Love the look of scrappy quilts. I’m working on so many things right now that it is a little overwhelming. Usually, I just do one project at a time. I’m working on a blouse and dress for me, some wash clothes for a housewarming gift and a cathedral quilt. I just need to buckle down and work on them. Forget housework. I am working on a wedding quilt and a postage stamp lap quilt using all sorts of reproduction fabrics. I am working on a granny square quilt and sampler doll bed quilts! I follow via bloglovin! Thanks for the chance to win! I just finished quilting a lap quilt, and I am working on a quilted bag (and several other small projects) as well! I am working on a lap quilt at present. I recently finished piecing a very scrappy Irish Chain style quilt using the Catawampus pattern. It is king sized and used upwards of 30 different batiks with gray solid. I am most proud of it, but still have no clue on how I want to quilt it. I am currently working on 3 much smaller quilts with 384 HSTs in them in sizes of 1.5 to 4.5 inches. Thanks for the awesome giveaway. I’m working on a few charity quilts and then need to finish up Moehills & Kansas Dugouts I started at Sewtopia last month. My current projects are not really scrappy in that they use a whole line of fabrics that relate, but I do have several planned and in the works that are. 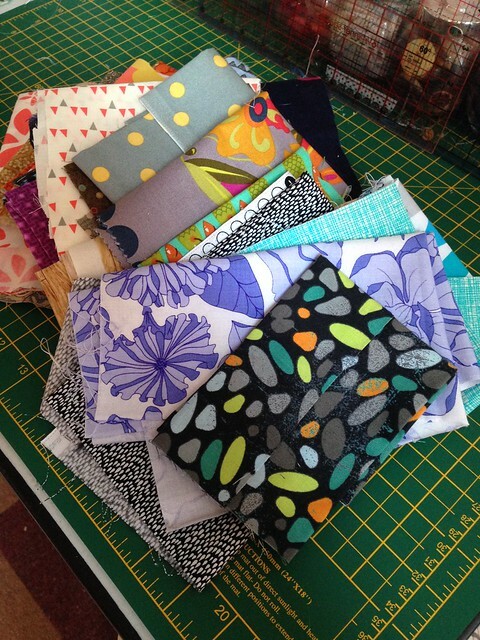 I certainly collect fabrics for several scrappy quilts that are on my mental list! I signed up to follow you by e-mail. I tend to get behind on my readers (blush). YOu have some beautiful prints there! I hope I win!!! I am currently working on fabric memory books and junk journals (check out my blog) and both use fabric and these bright designs would make great pages or cover covers. Plus, I quilt some, and might use these for some totes I intend to make along with matching zipper pouches.! I just got a scrappy bag pattern that this would be perfect for! I’m working on a reverse Irish Chain quilt. All the fabric is from the same collection, so not scrappy at all. Thanks for the chance to win! I’m working on a quilt inspired by Dear Jane, so definitely scrappy! I am collecting scraps for a quilt. I need 1000 different fabrics in graduated rainbow colors. Next up will be a beach themed mini quilt for a swap. But not all fabrics have arrived for that yet 🙂 Many thanks for the chance to win your giveaway! Just about to start another Jen Kingwell QAL, so scraps are GOOD! I am starting a baby quilt. I’m currently making quilted pillows for my living room 🙂 Thanks so much for this great giveaway! I’m working on a Spring cross stitched quilt top for World of Charity Stitching. I currently on a break. Have to finish curtains for my son’s room and decorative pillows for all my kids. Always working on bags. Love scraps for wallets and pouches. I’m working on a quilt for my daughter. I am working on Bonnie Hunter’s scrappy Mystery Quilt. I have a never ending scrappy hexagon project going. I don’t know what I’m going to do with them but they’re quick to make and help me relax in the evening. I am working on several paper piecing projects where scraps are always the star! thanks for the chance to win! I’m hand quilting, using perle cotton, on a scrappy black and orange table runner that has pumpkin and leaves appliques in the borders. currently working on an ancient 20 year old maple quilt, glad to see the back of it! been following you on ig for a while, and you very kindly follow me too! I am always working on several things at once. Right now I am making improv placemats, a princess dress, and new curtains for the back bedroom. Currently working on HST’s from scraps left from a few earlier projects…want to make a fun Throw with them. Also cutting Tumblers from some of the scraps too. I am currently starting on a knit dress for myself and finishing quilting a quilt. I just love scraps. I just love receiving packages in the mail. There you go. Thank you for being a part of the SMS Giveaway Day and giving me the chance to win those scraps. I am working on a lap quilt made with scrappy blocks from a block swap. Other people’s scraps re my favorite. Haha! I’ll put them in my stash and put them to use next time I’m inspired. I”m working on a harvest apron right now. Thanks. I love scraps and my plans for what to make this summer is a scrappy quilt. Thanks for the great giveaway. I am currently working on a mystery quilt. A new clue each week, and I’m making it entirely from scraps! I’m trying to finish a paper pieced Star Wars quilt, as well as using up scraps with a snowball quilt. If I won your scraps I think I’d have them sent to a friend! I saving up scraps for a nice quilt, but right now am making a summer blouse : ) Thank you for the chance to win. I’m working on a scrappy spools mini quilt – but I only have a small box of scraps so it’s proving tricky! Oh my goodness those fabric pieces are so pretty! I am just finishing up a retro hairband that reminded me of the 60’s and had to try to make it. I’m currently working on a crib skirt to match a baby quilt I made for my sister. I’m working on a 4 patch scrappy quilt! I’d love your scraps! I’m working on some summer clothes for my children. I’m currently putting the binding on a very scrappy bee quilt. Almost done! Thanks for the giveaway. I am working on a test quilt for a designer and it is scrappy!!! I’m a new follower on bloglovin. Love what I’ve seen so far! I always have something going-like maybe 30, hahaha. I love working on scrap quilts both modern and traditional to donate to local charities. So your scraps would help me with that!! Thanks for the chance! Hi – I’m working on a scrappy tote bag. Thank you! I’m working on a secret project. One I’m hoping to get published. Thanks for the opportunity. I am working on a very scrappy EPP quilt. It is blue and white and finally the end is in sight! I make scrappy inspirational lap quilts for people undergoing cancer treatments… thanks for the giveaways and for sharing your lovely projects! I am working on a jean quilt – made with my son’s pants and shorts (non jeans too). Very scrappy…and lots of cutting!!!!!!!! I am currently working on a tote bag. I’m working on a story quilt for my boy. I am presently working on two scrappy quilts , one sampler and one called charming stars , fun ! Thanks for the chance . I’ve never made a scrappy quilt because my stash isn’t built up enough to have many scraps. But I love scrappy quilts. I need to come up with teacher gifts, I’ve done mug rugs, coffee cozies and coin purses – all uses scraps! Right now I’m working on some summer hats! I;m just finishing the binding on an aqua and purple patchwork quilt. I’m working on an improv pieced book cover for an inter guild exchange. I am currently working on a t-shirt quilt. My first and last! Cannot wait to finish it! Currently working on an economy block I spy quilt for my kiddos. I am making clothes for my kiddos–nothing scrappy yet! Love this scrap pack. I am hand quilting a flying geese quilt right now! Well hello P-dawg. You are so good to take part in this again, I just ran out of time to get myself organized for this one…anyway I’ll happily take your rejects off your hands. You know I am a loyal follower of yours. I’m not working on anything at the moment, I do have some unfinished projects eyeballing me though. I’m working on a very colourful Kaffe Fassett quilt. Love it. And love your fabrics. I am also working on moving. More projects for me as soon as we are unpacked! Following on Bloglovin’ @trekkiechick. Again, thanks for a great giveaway! I LOVE scraps and other peoples are the best! Currently I am making pjs for 5 grandchildren, I also have 3 quilts on the go – one is a TARDIS quilt (Dr Who), and two baby quilts. I follow you on my Bloglovin reader page and have subscribed to your e-mail feed. Currently working on a needlebook and hst mini quilt for swaps. Not scrappy, but using stash. I’m working on a large appliqué quilt at the moment. It is using lots of batik scraps. Would love to win this collection of fabric and put it in my next scrappy quilt! If scrappy means using my scraps then no 🙂 Just making new scraps. I’m making a table runner, just started quilting it. Currently I’m working on some summer dresses for my little granddaughter. Working on a baby quilt- a scrappy one too 🙂 I just have to finish binding! I remember that awesome dress you made. Some day I can do that too! I’m only working on one scrappy project now – which is kind of a disaster. I want to do more scrappy work though. I’m making a quilt out of scraps of fabric that my mom used to make apron’s for all of my sister and sister-in-laws. Just finished up my Farmer’s wife quilt! I am making shorts for my daughters. I have 2 or 3 or maybe 4 or 5 WIPs? 🙂 And of course scrappy, that’s all I do. I’m currently working on a queen bed size Ocean Waves quilt, it’s close to being finished (yay!). I keep all my scraps but am yet to make a scrappy quilt, I think that should perhaps be my next project. Thanks for the awesome giveaway. I follow you via email subscription, thanks. I’m working on a memory quilt for a high school friend – with little bits and pieces contributed by other friends from back in the day. I follow you on bloglovin and by email. And on goodreads. I might spend too much time on the computer…. Nothing scrappy; I’m working on a pair of shorts. I’m actually working on a scrappy elephant quilt (pixelated) for my BFF’s soon to be born baby! love it! I love scrappy quilts! I’m working on a charm pack lap quilt right now. I’m quilting a quilt for my niece made from her dad and grandfather’s shirt in pin wheels. I love it! This weekend, I am finishing up a personalized bib order for a baby boy named Jonah. I appliqued a darling whale on it,, along with his name. It turned out so cute! I working on a quilt. It is so hot here today I can’t think straight but still, thanks for a great giveaway. I am currently working on an applique table runner. Thanks for the great giveaway! I use TONS of scraps – mostly for doll clothes. Thanks. One of my WIPs is a postage stamp quilt, so I’m always looking for scraps! I also follow you on instagram. I’m curlygirl75. I’m making a scrappy lap quilt! Finishing quilts for quilt Market. Can’t wait to get there. Thanks.